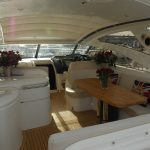 Upon boarding, you will immediately see that she is a very sociable motor yacht, with an open plan cockpit with plenty of seating and a large dining table which is perfect for alfresco dining. There is a built-in BBQ Grill and wet bar complete with sink and top loading ice box and ice maker, essential for keeping the wine and beers cool and at hand. For the sun worshippers, there are two dedicated sun bed decks, one on the bow of the boat and the other on the aft. The main cockpit also has an electrically operated sunroof which can be opened in a few seconds to provide further sun or shade when required. At the rear of the boat, there is a low level deck which gives easy access when boarding as well as a great swimming platform. An electrically opening garage under the aft sun deck is used to store our 58 mph Williams jet rib which we can use for skiing, wake boarding etc. For your convenience, there is also a hot/cold shower on the rear deck for washing down after a swim. On moving down into the living area, you are greeted by a spacious lounge area with large cream leather sofa and dining table TV, DVD player and an open plan galley finished in light cherry wood. The double master cabin has a luxurious feel, with large double bed and beautiful ensuite bathroom, finished with black granite worktops, electric flush toilet and separate shower cubicle. There is a good sized wardrobe and plenty of storage space. 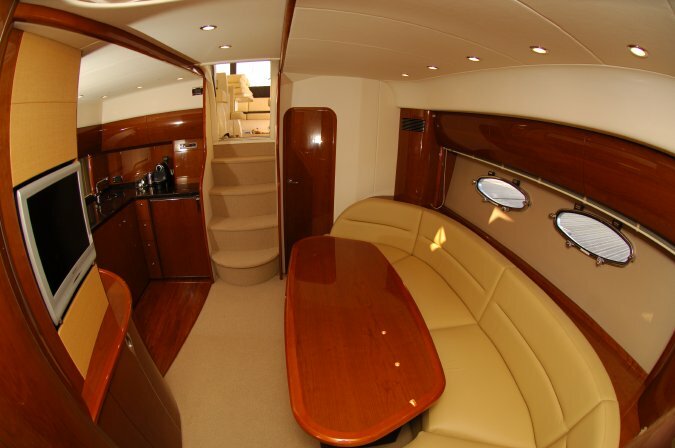 The twin berth aft cabin is full beam, with large wardrobe and dressing table with luxury ensuite bathroom. For occasional guests, the salon sofa converts to a double bed, thus providing accommodation for six. If you are a music fan, we have also had a state of the art sound system fitted comprising of an Alpine F1 Status head unit, 4 Genesis amplifiers and Genesis Absolute speakers providing you with a stunning sound experience. Our V48 has been Category 2 coded for charter use (anywhere in the UK and North European coast) and is equipped with the highest possible specification of safety and navigation equipment for up to 12 persons (2 crew 10 guests). With her long-range cruising potential, high maximum speeds and outstanding sea keeping the V48 offers a stylish solution to all weather boating. 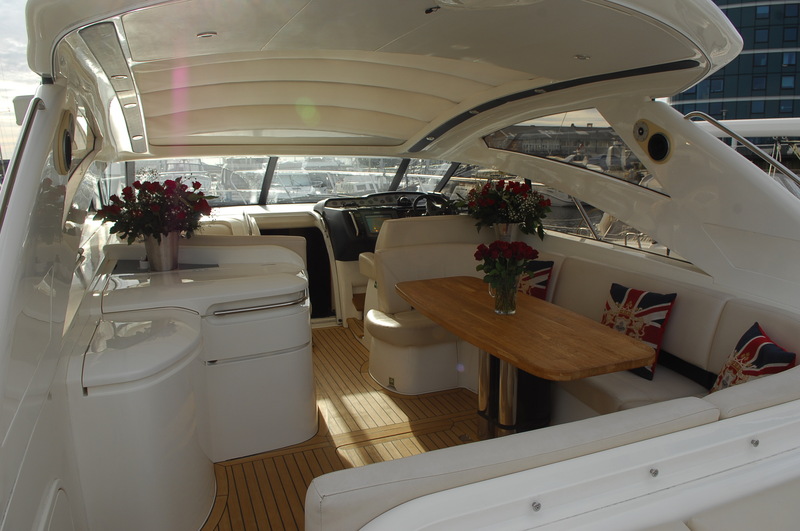 Luxury Motor Yacht Whether judged on accommodation, styling or speed, the Princess V48 motor yacht sets a new standard for her class. She is powered by twin Volvo D9 575 horse power engines which can push the boat in excess of 38 knots with stunning acceleration. 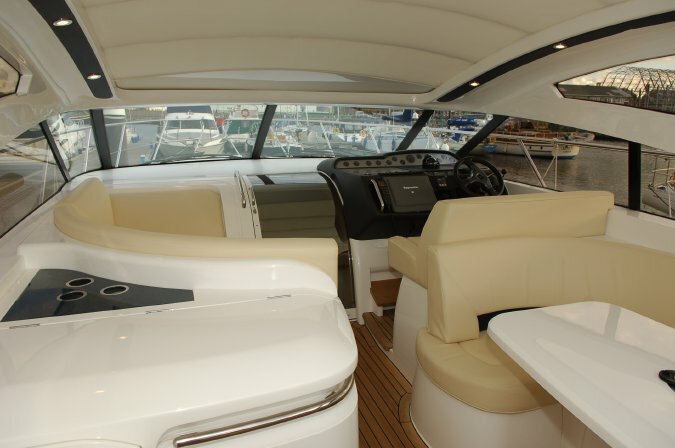 She is also fitted with state of the art navigation, radar and VHF equipment. Download Technical Specification Full technical details on the Princess V48 Motor Yacht are available here.